The refurbished Dell T5500 Workstation is a productivity powerhouse featuring Intel QuickPath technology for a range of 64-bit Intel Xeon processors delivering highly efficient performance even for memory-intensive peak workloads. The twin socket system board features capacity for up to two Quad-Core or Six-core (5500/5600) Xeon processors, turbo-charged with the Intel Hyper-Threading technology VT-x hardware virtualization support to enhance multitasking experience for virtual machines and 3D rendering applications running on multiple screens simultaneously. Combine the T5400 with a CUDA capable graphics card for demanding graphical design applications such as CAD, GIS, and digital content creation. The Dell Precision T7400 offers dual Native PCIe Gen 2 x16 slot support, allowing for up to 225 watt graphics cards. The LSI 1068e SAS/SATA RAID controller (RAID 0 & 1) provides On-Board data control for up to three x 3.5” (LFF) hard drives, with a full complement of 2TB SATA drives yielding an enormous 6TB storage space! The highly scalable and compact chassis of the refurbished T5500 machine is designed for flexibility, supporting ECC Registered memory up to 72GB and a wide range of the latest and greatest graphics card with its two PCIe x16 Gen2 graphics slots. Maximum storage capacity is 6TB with two 3.5” internal drive bays and two 5.25” external drives in optical bays. The integrated SATA RAID controller (RAID 0, 1, 5) supports 10K RPM SATA II hard drives and Solid State Drives, with optional SAS 6/ir and PERC 6/i controllers available for SAS RAID configurations. 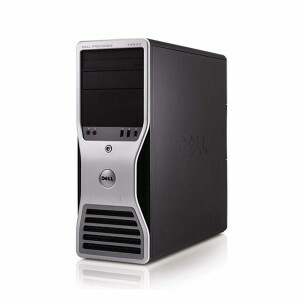 The Dell T5500 spans 6.73" x 17.64" x 18.54" (WxHxD) in a minitower orientation, balancing expandability and airflow requirements with a space-saving, unobtrusive chassis. Meanwhile the workstation’s 875W PSU conforms to Energy Star and EPEAT standards in delivering 85 percent efficiency and silent operations for demanding workloads without compromising performance. Customized T5500 workstations offer outstanding scalability in a powerful yet compact form factor empowering you to power through resource-consuming compute efficiently. The Bargain Hardware configure-to-order service ensures the highest quality and value for money for you refurbished Dell Precision T5500 workstation. A wide range of product options and configuration choices put you in control of what matters most, and always well within budget. Should you have any question or queries with your order then please don’t hesitate to contact us using the contact info below.